release dates set…Earth Rocker delux 6/24. Robot Hive/ Exodus vinyl 6/10. CLUTCH, the acclaimed Maryland-based rock group, have teamed with producer J. Robbins (The Sword, Coliseum) to record the new song “Run, John Barleycorn, Run.” The track will be released on Friday, April 19 via Weathermaker Music as a special split 7” single with labelmates Lionize as part of Record Store Day. 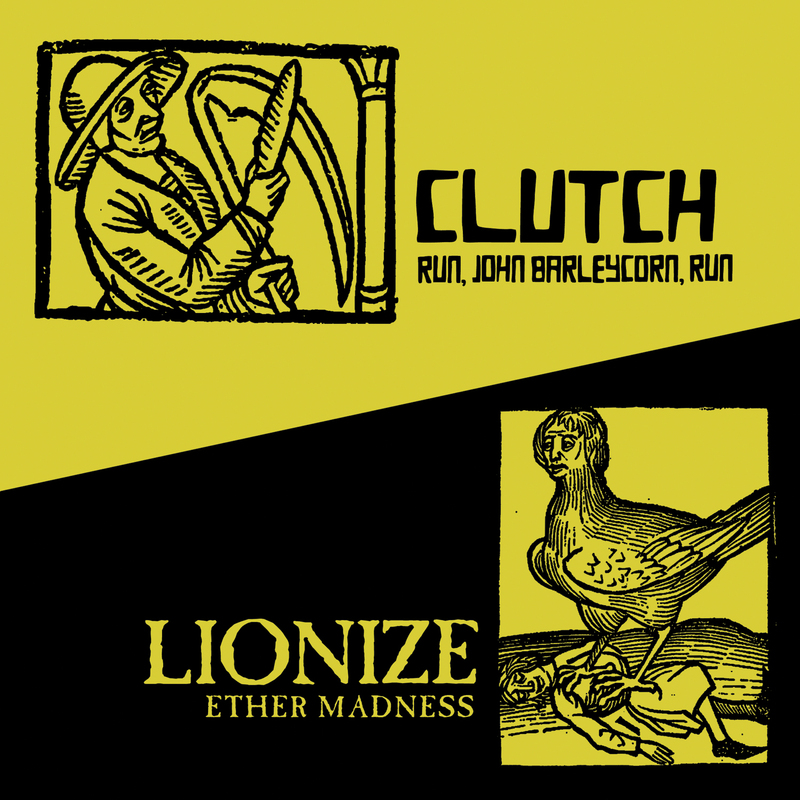 CLUTCH/Lionize split 7” single artwork: http://msopr.com/files/run_john_barleycorn_run_cover.jpg. On June 24th, 2014, CLUTCH will release a triple deluxe version of their acclaimed EARTH ROCKER album via Weathermaker Music. Released in 2013, EARTH ROCKER was tagged by Rolling Stone on the “Top 20 Metal Albums” list and hailed by the magazine for its fusion of “seething admixtures of jam-band chops, careening blues-punk riffs” (December 2013). The EARTH ROCKER triple deluxe album package will include: 1) the full record and brand new songs “Night Hag” and “Scavengers,” 2) “Earth Rocker Live,” a CD audio version of the album performed live; and 3) on DVD “Live In Denver” recorded with seven cameras in 1080i on Nov. 14 at the sold-out Ogden Theatre show in Denver, two videos shot, directed and edited by actress Aisha Tyler: “Gone Cold” (unreleased) and “Crucial Velocity.” To pre-order EARTH ROCKER, visit: www.clutchmerch.com. Produced, engineered and mixed by Machine (King Crimson, Lamb Of God), EARTH ROCKER’s triple deluxe cover artwork was created by long time CLUTCH art director Nick Lakiotis (see below). EARTH ROCKER continues to garner the group some of the best reviews of their career. Read the critical soundbites so far for EARTH ROCKER here: http://msopr.com/files/clutch-earth_rocker-critical_soundbites.pdf. Earth Rocker cover artwork by Nick Lakiotis: http://tinyurl.com/lg8ofkk. The group have announced their classic 2005 album Robot Hive/Exodus will receive a collector’s edition double vinyl release on Tuesday, June 10. The beautiful double LP is re-mastered and comes in a re-designed gatefold package boasting some of CLUTCH’s best tracks. CLUTCH—NEIL FALLON (vocals, rhythm guitar), TIM SULT (lead guitar), DAN MAINES (bass,), JEAN-PAUL GASTER (drums and percussion)—will launch an overseas tour starting Tuesday, April 22 in Newcastle, UK at the O2 Academy taking them through the European festival circuit through June 29. In July, they’ll return to the U.S. for a handful of shows before joining Jane’s Addiction, Rise Against, Gogol Bordello and Halestorm at the Shindig Festival in Baltimore, MD on Saturday, September 27. Expect the group to announce additional U.S. festival dates and headlining shows in the coming months.